The ADB’s Outlook says external debt servicing costs appear ‘likely to increase given downward pressure on the kina’. It anticipates that this year the cost of domestic debt servicing will increase significantly. According to the ADB, domestic debt stands at about 28 per cent of GDP, while external debt equals 12 per cent of GDP. “Nearly half of the domestic debt (48.1 per cent) is in Treasury bills for which yields have risen and maturity dates shortened,” the Outlook says. “In 2014, no Treasury bills matured in less than 100 days, but at the start of 2016 such short-term Treasury bills accounted for an estimated 24 per cent of the portfolio outstanding. “As domestic debt has shifted to shorter maturities, interest costs and refinancing risks have risen. Basnett says the shift towards more short dated maturities ‘is driven by risk appetite and liquidity preference of the participants in the public debt market.’ He believes the Government’s debt strategy will need to change. “Debt restructuring, through lower interest and longer tenor (length of the loan), will provide short-term relief from the pressures on the public purse to service debt on the books,” he says. 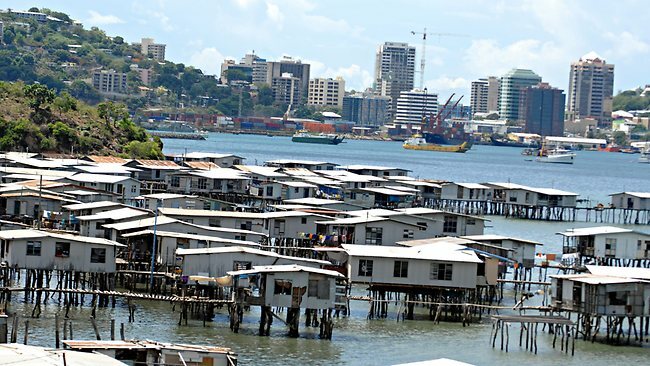 Many of the economic fundamentals in PNG are positive. According to the Bank of Papua New Guinea’s December 2015 Quarterly Economic Bulletin, last year the country recorded a trade surplus and a current account surplus. It was only on the financial account that there was a sizeable deficit. The Bank’s Bulletin says total non-mining GDP is expected to grow at 3.4 percent this year, up from 2.4 percent in 2015. This has not alleviated the pressure on the exchange rate, however, and there is a persistent shortage of foreign currency. How can the government deal with the lack of demand for the kina? Basnett says the problem has several dimensions. ‘Theory tells us that if there is a shortage then there should also be someone willing to trade. So the question ought to be: “Why is that not happening?” Getting the price of the exchange rate right is part of the issue, but it is equally important to consider the impact of uncertainty. Hence, price adjustment alone might not be sufficient. There is a behavioral component that is being influenced by uncertainty. So those who hold US dollars (the suppliers) seem to be unwilling to trade. If only the price is adjusted there is no guarantee that it will bring certainty, and could result in continued shortage, but at a lower price point. Basnett adds that ‘unwinding after a large foreign investment in a context of weak institutions to manage the transition’ was always going to be a challenge. The downturn in commodities prices has further accentuated the difficulties, he says. “In the immediate-term, the size of deficit should be controlled and expenditure re-prioritized, and along with it necessary public finance management reform identified by the Government should be implemented without delay. This will directly alleviate the tricky financial issue—public cash flow management.”..